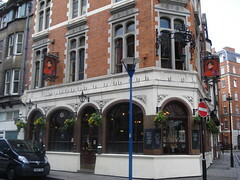 Pub in Holborn. It's actually owned by the London School of Economics, like many other buildings in the area. There's a big LSE sign above the bar. Non-students are allowed in though. They have a bookable function room. The main area on the ground floor is quite open, with large mirrors and windows and a high, ornate ceiling. The decor is dark wood, polished floorboards, and high-backed benches covered in tatty fabric. The tables and chairs/benches are clustered around the edges of the room, leaving a large open space in front of the bar. Kake visited on a Thursday afternoon in April 2008. It was empty when I arrived a little before 4pm; it started filling up around 5pm, there were no seats left by 5:30pm, and the room was entirely full by 6:30pm. Music was playing throughout my visit, but at a reasonable enough volume. Beers available were Black Sheep (£2.60/pint), Deuchars IPA, Timothy Taylor Landlord, and one other (I think Adnams). Food is served all day (I think) but is limited to sandwiches, pasties, and soup/risotto/etc heated up in the microwave. Kake tried the "chunky soup of the day" (£3) which turned out to be tomato and red pepper; it was really not delicious, and I only ate it because I was hungry and I knew we'd be eating dinner late. Generous portion of decent enough bread with it, though. Might come back if I was in the area, but I suspect there may be better options. Last visited by Kake, 24 April 2008. Opening hours taken from blackboard outside on that visit. Last edited 2013-05-10 07:14:08 (version 4; diff). List all versions. Page last edited 2013-05-10 07:14:08 (version 4).